Jack Daniel’s White Rabbit Saloon Promotion. I’ve written about the exquisite design work Stranger and Stranger creates for the beverage industry before. 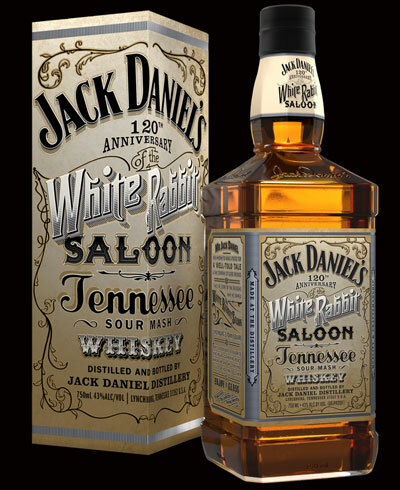 Their work never ceases to amaze me, and the bottle and packaging design for Jack Daniel’s White Rabbit is no exception. To help promote the the new adult libation and the packaging design, designer Florent Carlier teamed up with ReflexParis to create a direct mail piece that was printed directly onto a wooden substrate. The limited edition promotion piece was based on the original design by Stranger & Stranger, and used a digital printing method to produce the final result. Even the white ink. Great work from both Florent Carlier, and Stranger and Stranger. Posted in Design and Art, Packaging and tagged Digital Printing, Direct Mail, Florent Carlier, Jack Daniel's, Package design, Promotion, ReflexParis, Stranger & Stranger, Stranger&Stranger, Whiskey on May 9, 2013 by Author. 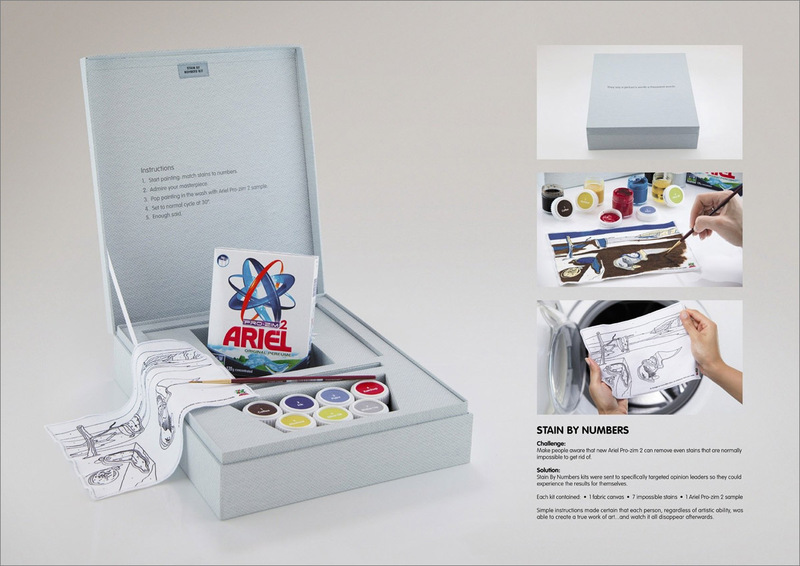 Saatchi & Saatchi’s Brilliant Ariel Pro-zim Direct Mail Advertising. I’m waiting for a delivery at my house, which was supposed to be here an hour ago. Since I can’t access my company network from home, and I am feeling a bit lazy this Friday morning when it comes to free-lance work, I thought I’d post this on the blog. If you are going to do direct mail advertising, you better come up with a concept that is not only sticky, but clever enough to get your target audience to respond to it. This is where the new Ariel Pro-zim campaign from Saatchi & Saatchi, Dubai, really shines. They produced and mailed out something that is pretty hard not to notice, and more importantly, pretty hard to not want to try. The “Satin by the Numbers” kits were sent specifically to targeted opinion leaders so they could experience the product themselves. EAch kit contained one fabric paint by numbers canvas, seven impossible to remove stains in the form of paint tins, and one Ariel Pro-zim sample. The kit has simple instructions, which make certain even the most creatively challenged can create a work of art from things like ink, coffee, and ketchup. After you are done, you simply toss the painting in the washer with Ariel Pro-zim and watch your masterpiece dissolve. The Ariel Pro-zim 2 Stain By Numbers ad campaign is pretty clever, reverting back to childhood fun in order to attract sales. I’d like to see what kind of sales conversions they had after running this, but no matter what the results are, the ad is still great. Posted in Advertising and tagged Advertising, Detergent, Direct Mail, Marketing, Print Advertising, Saatchi & Saatchi on May 21, 2010 by Author. Last night I was having a conversation with a potential free-lance client about the way to get the best bang for their buck, based on the size of the marketing budget they have. Said client was adamant about using things like, and I quote here, “That social stuff, you know the Twitter and that Facebook thing”. So my question to them was; how much time have you spent using social networking, and do you have any kind of presence on any social networking sites now? The answer was very little time and no presence. I told the client that this wasn’t a problem, and I had one more question for them. I ask, does your target audience include a group that is heavily involved in social networking? This question was key to helping the client spend their money wisely and helping them to develop a cohesive strategy. The client told me they didn’t really know, but they heard things like Twitter were the hot place to advertise. After 15 or so minutes of discussion about social networking, and other forms of digital marketing, I proposed that they should indeed explore this, but not give up on traditional media channels as well. My proposal to them, was to create a Facebook fan page, and a Twitter account. Have Tweets, update the Facebook page, and dedicate someone on their small marketing staff to post relevant content to both areas a few times a day. I also said that they should add follow buttons to their website for both Facebook, and Twitter. I explained that the only out-of-pocket expense was the time invested. Then I went on to explain to them why they shouldn’t drop the direct mail campaigns they have used in the past. According to the United States Post Office, direct mail advertising represented 63% of all mail received by households in 2008. Of that, 79% of households either read or scan advertising mail sent to their household and 11% respond and take action. Compare this to e-mail marketing: Mail Chimp’s research indicates the average open-rate for marketing e-mail is about 25% and the click-through/take-action rate is only 4.28%. (100,000 direct mail units sent get 63,000 views, which equates to 49,770 people responding on average.) Now that does not mean this client should give up on email marketing, it simply means that direct mail is still a very viable form of advertising. So how do you guarantee the best return on investment and potentially increase follow through when designing direct mail? Have a clear call to action. A couple of years ago, I got a letter asking me to support local charity in my city. It was a cause I could get behind so with pen in hand I was ready to write a check. I scoured the letter only to find that there was no return address, no phone number and no way to easily send them money. Sure, I could have looked up the number and contacted them, but expecting your recipients to do that is expecting too much. No clear call to action means no follow through. Make sure you provide a clear way to respond to your direct mail. Is there a number to call? A Web site to visit? Make it obvious. If you have a website, use it to track the results of your direct mail piece. Make sure what is mailed out, has a unique URL for your site that can be tracked to measure the number of unique page views generated by your mailing. At the very least, each direct mail piece that goes out should have a dedicated phone extension or Web landing page, so that you can track your results. Take advantage of variable data printing. Just a few years ago, there was one main option for printing in color. That option was offset printing. Today things are different thanks to advances in printing technology. Not only is it affordable to digitally print short-runs, it’s possible to customize your projects using variable data printing (VDP). For example, say you’re designing for a client’s annual annual report. If the client has a database of current shareholders, including their names, and the years and amount of stock they own, it’s easy to print that information right in the body of your piece. It personalizes the experience and shows how well their investment performed over the course of the year. Design something different. If it stands out, there is a greater chance that someone will look at it. You don’t have to break the bank with process, or special die cuts. You just need to create a compelling piece, whether it is 2 color, or 6 colors with varnish, a special die, and an oversized shape. One of the things about direct mail that still works is, even with a smaller budget you can get great results, especially when you tie it back to your digital strategy. Posted in Advertising, Media and Mediums, Social Networking, Technology and tagged Advertising, Direct Mail, Direct Mail Marketing, Social Networking, Social Networking Strategy on April 8, 2010 by Author. I found this today on the Marketing Magazine website and fell in love with the whole concept for this direct mail piece. Apparently this was shipped almost a years ago, and it completely slipped under my radar. 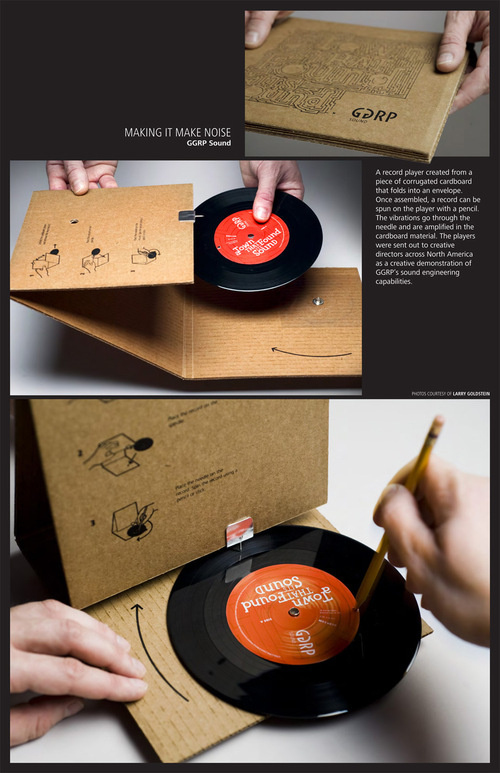 Ad Agency “Grey” from Vancouver Canada produced this clever portable record player for GGRP that is made from the corrugated cardboard sleeve that is the mailer for the 45 RPM record inside. 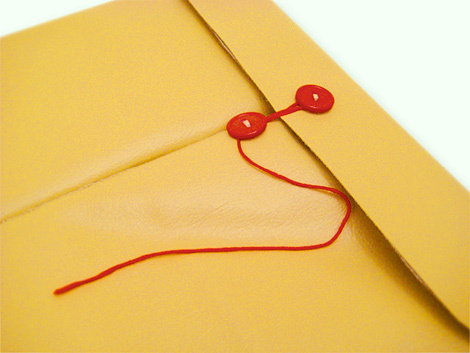 You simply fold the envelope up, place the record underneath and spin it with a pencil to play the children’s story, “A Town That Found Sound”. The hollow space behind the needle works like a sound chamber to amplify the audio. According to Geoff Dawson, , associate director at Grey, “It’s actually shocking how good the sound quality is, it took a long time of playing with different materials and designs to get the audio just right”. 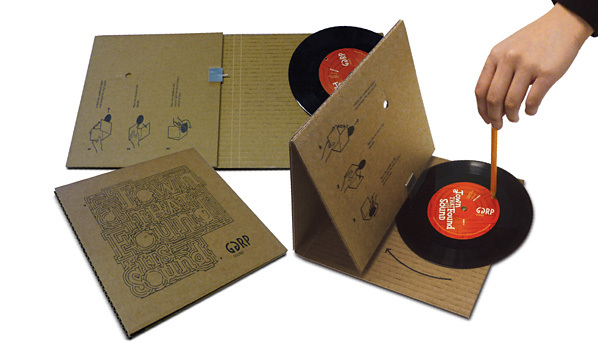 Grey came up with the idea based on the deep history of GGRP, and the relationship of the audio industry to its roots in vinyl records. Vinyl is undergoing a resurgence in popularity and the design helps to reinforce the creativity that GGRP brings to the table. Grey wanted to showcase GGRP’s creativity and love for sound, and I think they have pulled it off quite brilliantly. This simple, well designed, clever direct mail piece has brought more traffic to GGRP than any other item they used. The response has been so strong, that recipients of the mailer have been calling GGRP and asking for more copies to take home to their kids and give to others in the office. Posted in Advertising, Music and such, Pure Fun., Technology and tagged Advertising, Canada, Direct Mail, GGRP, Grey, Record Player, Vancouver on March 18, 2010 by Author.